(Publisher’s Description) The four so far published photo folders by Andreas Trogisch fascinated and enchanted us. Now the both last folders “Asphalt” and “Desiderata” complete the cycle. They are published in an edition of 100 numbered and signed copies by the publisher “Peperoni Books”. The sixth and final folder is called “Desiderata” and contains 28 b&w photographs from the photographer’s extensive work. The magical poetical aura of these images oscillates between pausing and going on, longing and home sickness and wanderlust. The folder’s title may help a bit to slightly get closer to its mystery. Wishing! Having the desire to be here and away, wishing forwards and backwards, in the end even a fulfilled life. 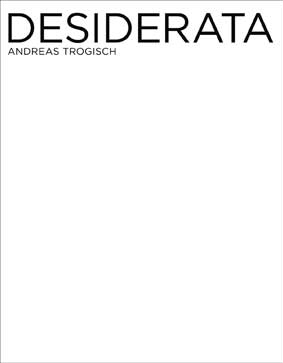 That is perhaps the reason why one can view Andreas Trogisch’ images best with eyes closed.